The support of Hollywood actor Liam Neeson for the staff at the Michelin plant in Ballymena who have just been told about the site’s closure has come at a vital time insists the MP for the area Ian Paisley. Neeson, himself from Ballymena, offered his sympathies to the hundreds affected and has urged the Northern Ireland Executive to use this devastating news as a springboard to get to work and make the prospect of the job losses as easy to bear as possible for the 860 staff set to lose their jobs by 2018. Mr Paisley commented “Having this morning secured a debate in the House of Commons about the closure (scheduled for Tuesday 17th), the support of influential figures such as Liam will go a long way to keeping this awful news in the public eye. Mr Neeson concluded “All the more reason for the Executive in Northern Ireland to really get to work now and promote the province. The sad news today that Michelin will close its doors in North Antrim in 2018 is apocalyptic in terms of employment for my constituency. 860 workers, in the jaws of Christmas, have received the news that they are now effectively on notice and my heart goes out to them at this time. It cannot be overstated how big a blow this is to the manufacturing industry in Northern Ireland. For North Antrim this means the loss of millions of pounds of wages annually and is frankly hard to come to terms with. I understand that the announcement is part of a wider EU re-structuring by the company and anyone who has followed tyre manufacturing trends, as I have, will have noticed the impact that cheap Far Eastern imports have had on Goodyear and how over-capacity has resulted in re-structuring elsewhere. The North Antrim factory has put up a valiant fight, but today they have bowed their head. I have for several years campaigned for reduced energy costs to assist this company and I know that much work was done to assist them from central government. But the re-structuring has not saved the North Antrim plant and frankly the UK operation, whilst they have cut off an arm today, I believe their ultimate survival is not certain. I have spoken with Michelin at some length and I have asked that those who are in position to be re-located to other plants, that this is offered. That a most generous package will be put in place for them and that importantly I have secured from the Michelin Development Community Fund (MDCF), £5 million to assist the local community with new employment start-ups. This will go some way in creating fresh opportunities. I have today tabled an urgent question in parliament and intend on raising this matter tomorrow (Wednesday). This sees another massive blow to the manufacturing industry in North Antrim and my heart goes out to all those affected. Ian Paisley MP has pledged his support to the ‘Every Child A Life Saver’ campaign set up as a joint initiative by St John’s Ambulance, The British Red Cross and the British Heart Foundation to campaign for First Aid training to be made compulsory in all Secondary Schools. The campaign has been set up in advance of the 2nd reading of the Emergency First Aid Education Bill which is due to take place on the 20th November. 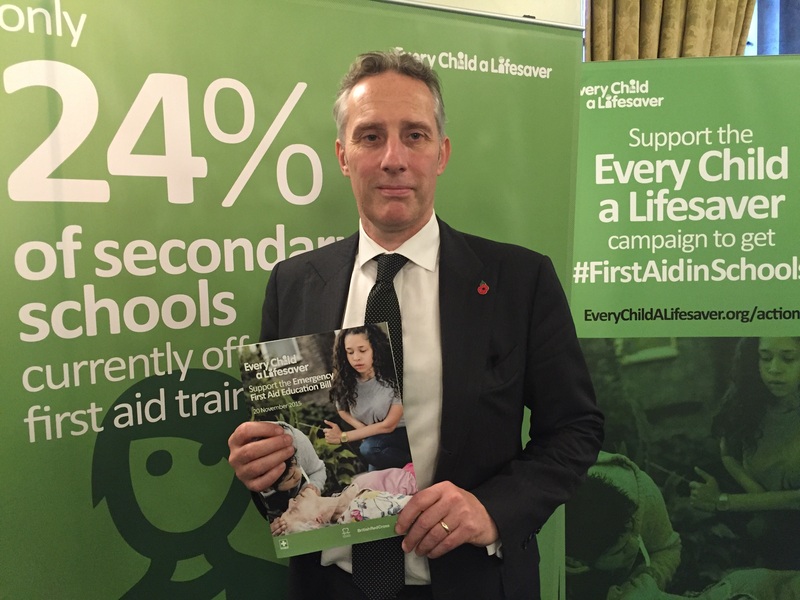 Ian Paisley MP at the Every Child A Life Saver reception in Westminster this week. Research has shown that 97% of UK 11-16 year olds agree that they should be taught emergency first aid in schools and believe it should be made compulsory. The Bill, tabled by Teresa Pearce MP, would require secondary schools to give young people the skills and confidence to deal with a range of medical emergencies including cardiac arrests, heart attacks, choking, bleeding, asthma attacks, and seizures. The Khayber restaurant in Ballymena were this week the highest placed Northern Ireland entry to the Tiffin Cup in Westminster. Having been nominated by North Antrim MP Ian Paisley, the restaurant made it to the final of the event, which involved a ‘cook-off’ in the Houses of Parliament. There were 10 finalists to make it through the judging panel to compete in the charity event’s finale in Westminster, judged by celebrity chef Ainsley Harriott. 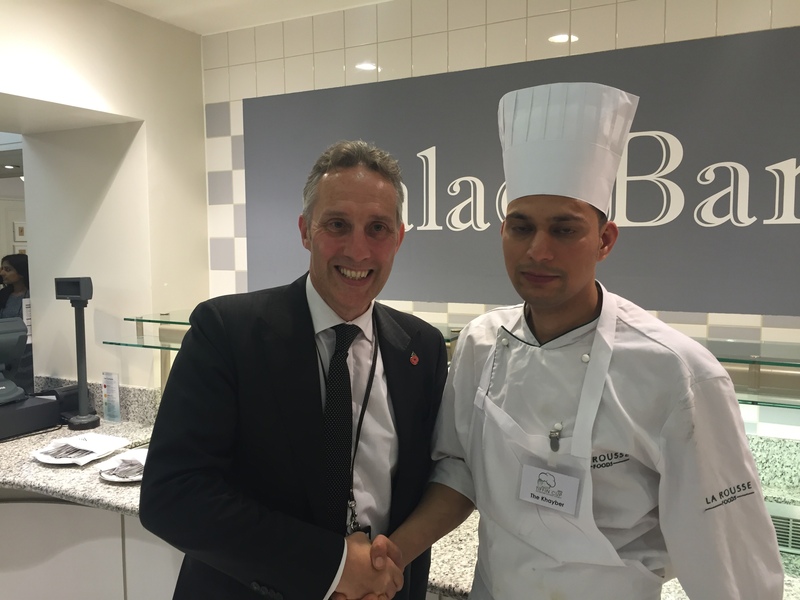 The Khayber, represented by head chef Jayenbra Kaintura, were the highest placed Northern Ireland entry to the competition and finished 5th in the whole of the UK. The Tiffin Cup, is a charity event hosted by Keith Vaz MP and is now in its 7th year. There were over 150 restaurants entered in this year’s competition from right across the United Kingdom. ‘The type of attack suffered by TalkTalk once again highlights the significant danger that cybercrime poses and the impact that it can have on the community. Virtually every household will have banking or other personal information stored by companies on computer systems and should those systems be compromised it can leave people vulnerable to a range of crimes. I welcome that the PSNI have secured evidence and been able to make this arrest. I know that in this instance they are working hand in hand with the Metropolitan police as they investigate a crime which has caused concern to people right across the United Kingdom. The Keep Me Posted group have received a boost from Ian Paisley MP for North Antrim, who has backed the campaign to give consumers the right to choose, without disadvantage, how they are contacted by banks and financial service companies, utility companies, and other service providers. The North Antrim MP sponsored a drop-in session for the campaign in parliament this week. He met with Judith Donovan CBE, who chairs Keep Me Posted, to hear more about the campaign and to offer support. He has previously signed an Early Day Motion backing the campaign in the House of Commons. Keep Me Posted is a partnership of more than 80 representatives from charities, interest groups and businesses including Age UK, National Consumer Federation, Salvation Army, Esther Rantzen’s Silver Line and the Institute of Consumer Affairs, who are increasingly concerned about the growing trend towards online-only bills and statements and the impact this is having on people’s ability to effectively manage their finances. The campaign’s research has shown that people understand their finances better and make better financial decisions when they receive information on paper, rather than online*. This week’s report from leading digital charity Go On UK also highlighted that in parts of the UK, one in three adults do not have the basic digital skills needed to effectively manage financial affairs online. The UK already lags behind other countries such as Spain, France, Germany and Finland, where the right for consumers to receive free paper bills and statements is enshrined in law. 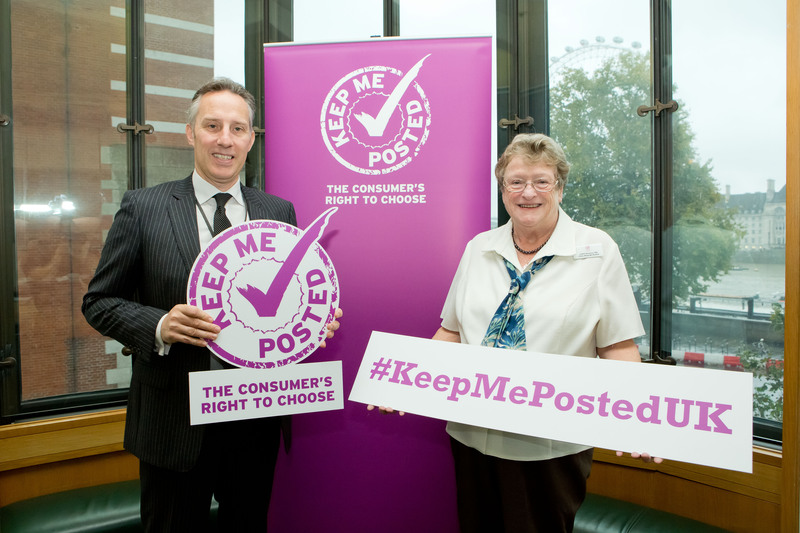 Ian Paisley MP with Judith Donovan CBE, Chair of the Keep Me Posted campaign at their Westminster drop-in event this week. You can sign up to the Keep Me Posted campaign yourself by calling 020 7566 9773, writing to Keep Me Posted, 24a St John’s Street London EC4P 4DZ or sharing your stories, preferences and experiences at www.keepmeposted.uk.com. 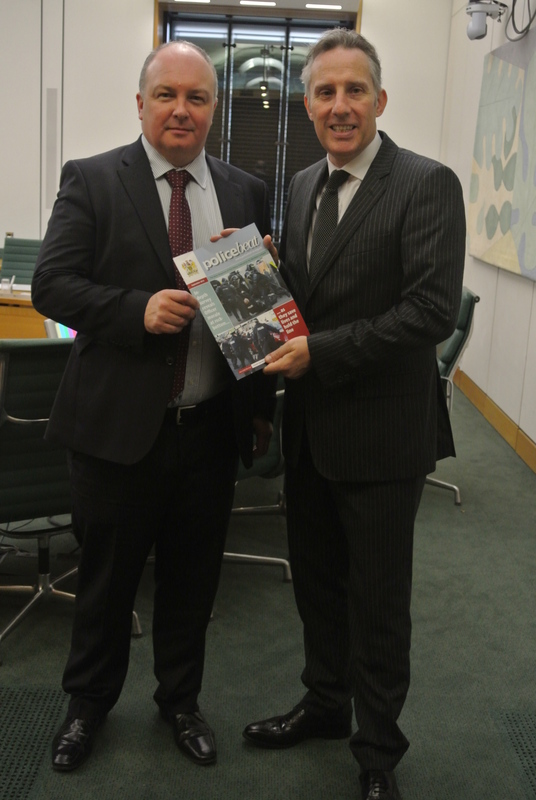 Ian Paisley MP met with Police Federation for Northern Ireland Chairman Mark Lindsay in Westminster yesterday to discuss the findings of the independent review that was carried out on behalf of the Police Federation on staff morale. Mr Paisley commented “The results of the review were certainly alarming, but perhaps more worryingly, they weren’t overly surprising. The pressure continues to mount on police forces right across the United Kingdom are undoubtedly feeling the pinch of cutbacks, but with the PSNI having the dissident republican threat looming over their heads as well, it is little wonder that morale is at such a low. Ian Paisley MP this week attended the launch of the ‘Persecuted and Forgotten’ report on the global persecution of Christians. It looks at the worldwide persecution and genocide of millions of Christians across the world. The MP has called for the government to act following the release of this report. In the audience was a Chaldean Priest Fr Bazi who had been imprisoned by ISIS. He was beaten with hammers, tortured, had his back broken but refused to beg for his life telling them he believed in an afterlife and therefore was not afraid. He said that fleeing Christians couldn’t even go to refugee camps because they faced persecution from the Muslim majority in the camps. The DUP were the first party in the House of Commons to hold a debate on the persecution of Christians over five years ago. In a House of Commons vote this week the DUP MPs backed the government’s plan to eliminate the budget deficit by 2019 and to commit to surpluses in the budget when economic circumstances are normal. There is still a degree of financial flexibility within this deficit reduction proposal as the Chancellor of the Exchequer George Osborne will still have the ability to respond to economic shocks, providing he explains what he wishes to do and how he intends to get back on course to a budget surplus. The eight DUP MPs met with the Defence Minister this week to discuss the Strategic Review of the Defence Budget. In keeping with the DUP manifesto, they urged the Minister to ensure that the commitment to spend 2% of GDP on the defence budget was adhered to in order to ensure that the new threats from Russia and ISIS were capable of being responded to. Also discussed was the downsizing of all three areas of the armed forces and the potential impact this could have on those who remain. “The workload of our armed servicemen and women is already very stretched off the back of the Iraq and Afghanistan wars. How we protect our returning servicemen and women and how the new structures are phased in is imperative to the health and wellbeing of our troops” said Mr Paisley. The Military Covenant, which is of course not yet fully operational in Northern Ireland was another area of discussion. The group pushed the Minister to continue to work to see this implemented sooner rather than later. “From a business perspective we also emphasised how strongly we felt about preserving the level of industry that some of Northern Ireland’s biggest companies procure through MoD orders and purchasing. We encouraged the Minister to strongly consider Northern Ireland businesses and what they have to offer before looking further afield when considering future investments” said the North Antrim MP.